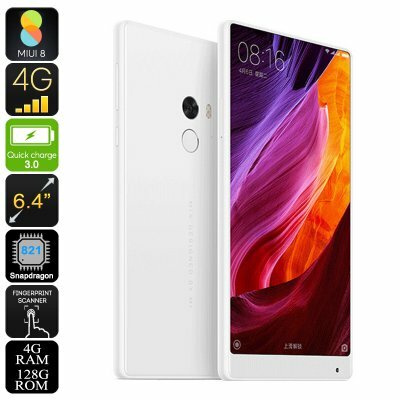 Successfully Added Xiaomi Mi Mix Android Phone - Bezel-less 6.4 Inch Display, Snapdragon 821 CPU, Android 6.0, 4GB RAM, Dual-Band WiFi, 4G to your Shopping Cart. With its stunning 91.3% body to screen ratio, the Xiaomi Mi Mix is the ultimate Android phone for anybody that wishes to enjoy their mobile entertainment to the absolute most. Featuring a bezel-less display, this Android smartphone truly brings forth a cinematic experience. Supporting 2048x1080p resolution, its massive 6.4-Inch display will treat you with visuals like never before. Whether you like to play games, watch movies, or browse the web – the Mi Mix will leave you with an everlasting impression. Thanks to its 4400mAh battery, you’ll be able to enjoy all the phone’s features throughout the day. Running on the MIUI 8 operating system that has been based on Android 6.0, the Mi Mix brings along a smooth user experience that supports numerous of customization features to adjust it to your own personal liking. Google Play provides free access to millions of the latest games and applications – letting you take the absolute most out of this flagship Android phone. For those of you that enjoy online games or simply like to stay in touch with your friends and family at all time, the phone supports 4G and Dual-Band WiFi. Thanks to this, you’ll always be able to browse the web and download files in the blink of an eye. Under its absolutely stunning bezel-less display, this Xiaomi Android phone packs the Qualcomm Snapdragon 821 processor. As a Quad-Core CPU that has been clocked at 2.35GHz, this piece of hardware lets you enjoy the most demanding of software without dropping a frame. Further increasing your user experience is the phone’s 4GB of RAM thanks to which you’ll be able to multitask and play graphically demanding games without needing to worry about slowing down your Android device. Supporting 128GB internal storage, the Mi Mix Android smartphone holds plenty of space for storing all your files, pictures, video’s, and mobile Apps. At the rear of this 6 Inch smartphone, you’ll find an ultra-fast fingerprint scanner that lets you unlock your Android phone in a split second. Accessing your files and contacts has never been easy as all your information will be at your disposal with the simple touch of a finger. Additionally, this android phone also features a stunning 16MP rear camera for shooting breathtaking 4K video and a sophisticated front snapper that is great for making selfies and for FHD online video calls with your loved ones. The Mi Mix Android Phone comes with a 12 months warranty, brought to you by the leader in electronic devices as well as wholesale electronic gadgets..